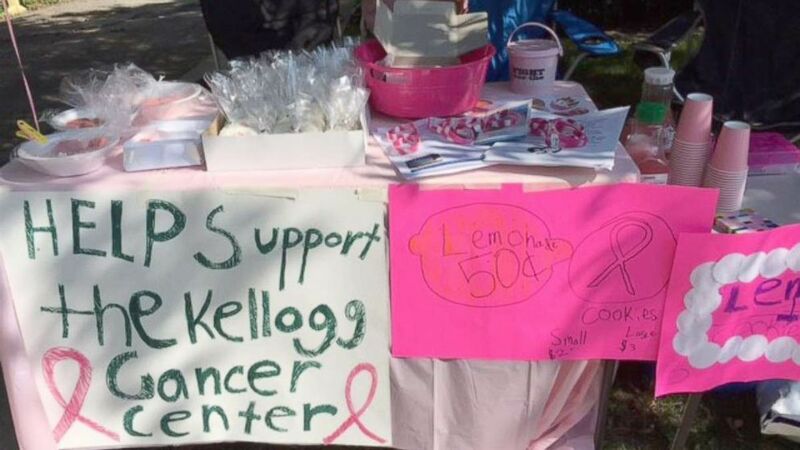 Olivia Ohlson started selling pink lemonade and pink ribbon cookies. When 10-year-old Olivia Ohlson learned that her mom was diagnosed with breast cancer, she jumped at the chance to help. 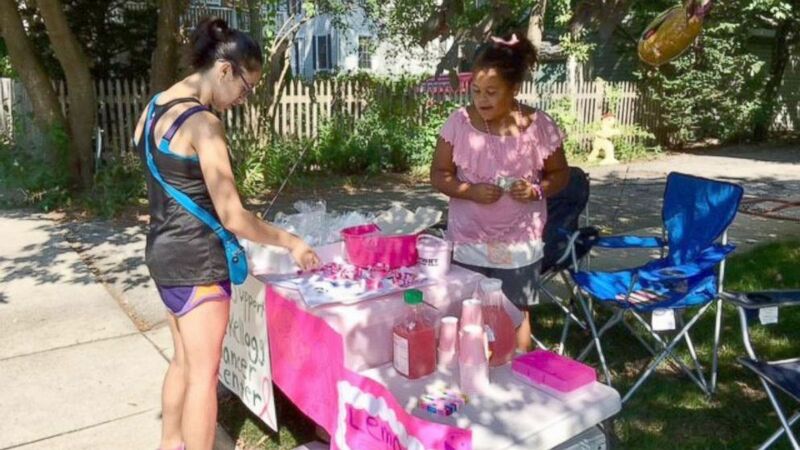 Olivia, a fifth-grader from Evanston, Illinois, made pink lemonade and baked shortbread cookies with her grandmother to sell outside the family’s home. “I always wanted to have a lemonade sale and when my mom got cancer I wanted to raise funds for women like her," Olivia told ABC News. "I thought that since I wanted to raise money, I could have a lemonade stand." 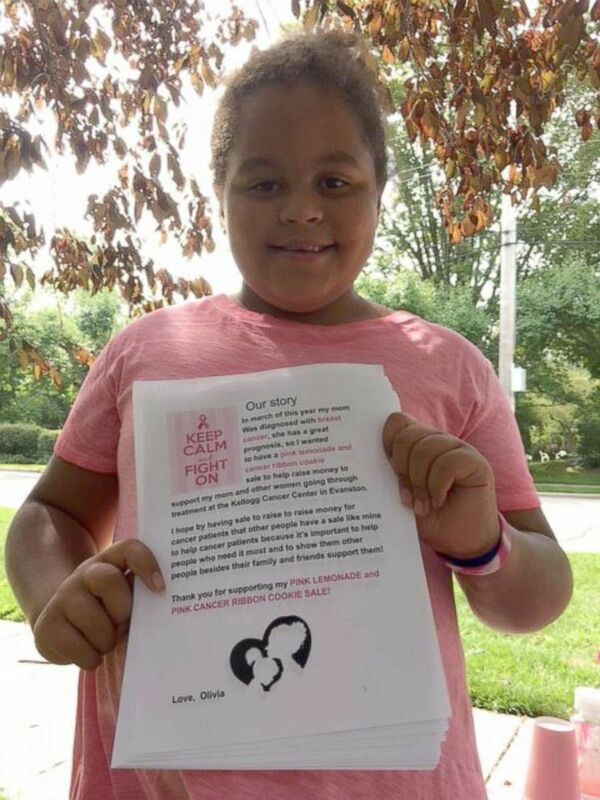 (Gini Ohlson) Olivia Ohlson, 10, holds a flier she made for a bake sale in her Evanston, Illinois, neighborhood to raise money for people affected by breast cancer. 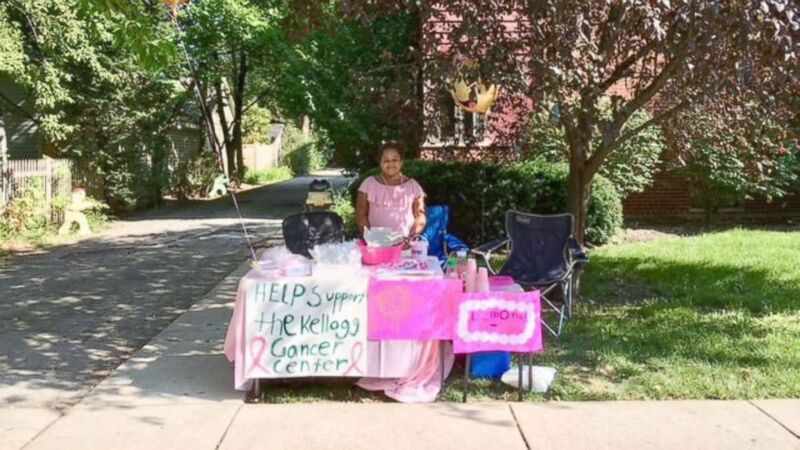 She also contacted local bakeries to ask that they donate cookies for her to sell in the shape of pink ribbons for breast cancer awareness. (Gini Ohlson) Olivia Ohlson, 10, sells baked goods to a customer at a bake sale she held in her Evanston, Illinois, neighborhood. Olivia has raised $4,500 through one bake sale and online donations made by family, friends and strangers. She is holding a second bake sale next weekend. (Gini Ohlson) Olivia Ohlson, 10, held a bake sale to raise money for people affected by breast cancer after her mother, Gini Ohlson, was diagnosed with breast cancer. Olivia said her favorite part of the bake sale was interacting with her customers. She is donating her proceeds to Northshore Kellogg Cancer Center, where her mom, Gini Ohlson, is being treated for breast cancer. "I know my mom has lots of family and friends who take care of her but other people don’t so they need more support," she said. "By giving Kellogg money they can use it ... for patients." (Gini Ohlson) Olivia Ohlson, 10, poses with her mom, Gini Ohlson, before, left, and after Gini Ohlson lost her hair due to chemotherapy. 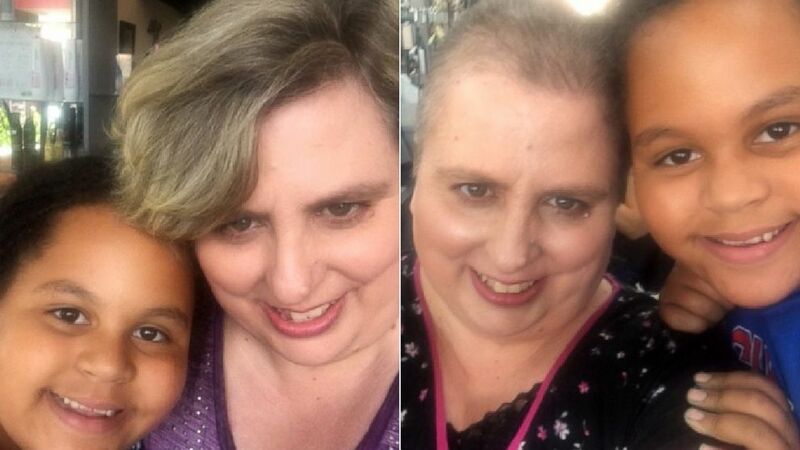 Ohlson, 50, was diagnosed with breast cancer in both of her breasts in March. She underwent a double mastectomy in May and said she is halfway through 16 rounds of preventive chemotherapy. Ohlson, the executive director of a nonprofit organization, may also need radiation in the future. Her early stage of breast cancer was diagnosed through her annual mammogram. Ohlson described herself as “very proud” of Olivia, her only child. She said she is most impressed that Olivia did all of the hard, behind-the-scenes work that bake sales entail. (Gini Ohlson) Olivia Ohlson, 10, made pink lemonade and asked bakeries do donate cookies in the shapes of pink ribbons to raise money for people affected by breast cancer. The money donated by Olivia will “provide support and resources to assist breast cancer patients and family members with the many challenges they face during diagnosis, treatment and beyond,” a NorthShore Kellogg Cancer Center spokeswoman told ABC News. "It’s important for our breast cancer patients and their families to receive the support they need for every aspect of the cancer journey. The funds raised from Olivia's bake sale are going to do just that," the center's director, Dr. Bruce Brockstein, told ABC News in a statement. "My colleagues and I here at the NorthShore Kellogg Cancer Center are so appreciative of Olivia's efforts to help our breast cancer patients. I hope that her efforts inspire others of all ages to support those who are going through cancer treatment."